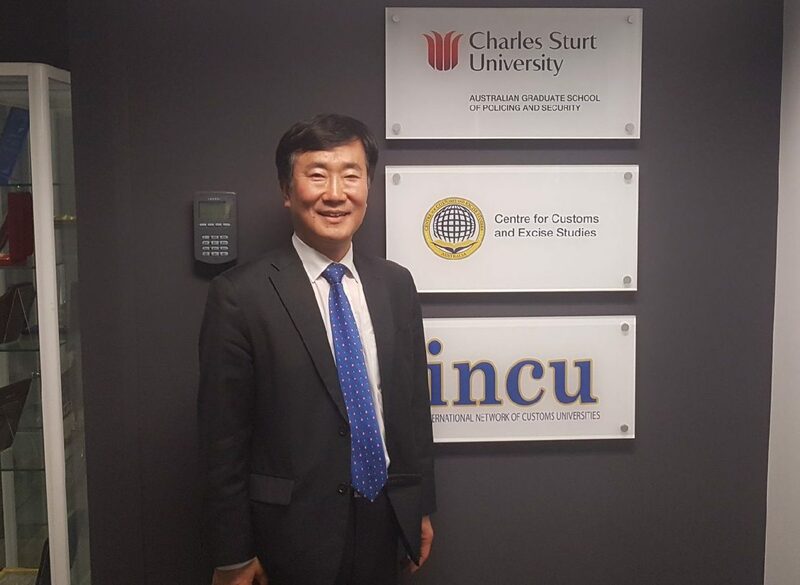 On 18 September 2018, a senior representative of Korea Customs Service (KCS), Mr Yoonshik Kim, visited the INCU and the Centre for Customs and Excise Studies (CCES) offices at Charles Sturt University (CSU) in Canberra, Australia (where the INCU head office is located). Mr Yoonshik Kim an expert in Customs and trade with more than 30 years of experience in Korea Customs Service. He is currently on an overseas research posting as a Visiting Fellow at the Australian Strategic Policy Institute (ASPI), which is located close to the INCU Office, undertaking a research project on comparative analysis of Customs risk management in Korea and Australia. Just before coming to Australia, Mr Kim worked as a Director-General of Export/Import Clearance Bureau at the Incheon Main Customs and was in charge of import and export clearance and investigation of smuggling and illegal foreign currency transactions. The main purpose of Mr Kim’s visit was to introduce himself and seek advice and feedback his research project scope and plan from INCU and CCES experts, as well as to learn more about activities of INCU and CCES. Mr Kim met with Head of INCU Secretariat, Dr Mikhail Kashubsky and CCES Senior Lecturer/INCU Member, Mr Athol Gardiner as well as CCES Director of Vocational Training, Mr Brent Juratowitch and CCES Regional Representative for Asia, Assoc. Prof Rob Preece. In the meeting, Mr Kim was provided with an overview of the INCU and its activities, and CCES educational/training program and research activities, and received feedback and guidance from Dr Mikhail Kashubsky and Mr Athol Gardiner in relation to his proposed research plan. In turn, Mr Kim provided an overview of the KCS and its Customs Training Centre’s educational programs, research and other activities. The visit also included a tour of the CSU Canberra campus.